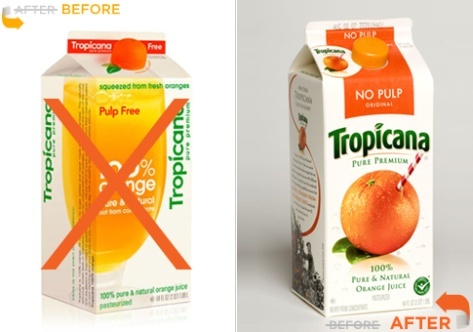 Some time ago UnderConsideration introduced the new design of the Tropicana packaging, a brand of the Pepsi Company. The new bottle showed a cold, anonymous big picture of a glass of orange juice with plain sans serif typography. Article ended the commentary with “I really want to believe that the screw-cap will not be an orange-colored boobie as in the rendering above”. 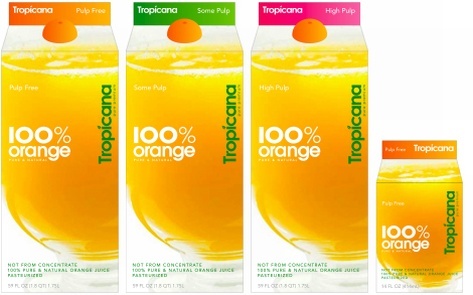 New packaging arouse hell in all designers communities, and after a brief test period Tropicana has decided to return to its old packaging. anymore the fresh fruit bursting with juice that made us all eager to drink.It became a plain product in a glass. Like anyone else. Maybe this loss of quality in packaging was even perceived as a loss of quality in the product itself in the usual consumer too? I mean…I’ve always liked clean and sleek designs and this design is not bad in itself. Really. and cut too much and in the end made it just…floppy. Tried and true usually still works. You do not have to re-invent the wheel every year. You’re right Richard. Thank you for commenting. lol I’ve been hating on this for weeks. I did not know pepsi owned tropicana, figures. All pepsi’s redesigns are also terrible anyone can throw a san serif for a logo. Pepsi underrated the fact that Tropicana has consumers so attached to the old-‘Tropic’ packaging that they were unlikely to appreciate a younger looking futuristic design. We did an eye tracking study on the effectiveness of the ‘New’ pack in the UK where we have never had the straw graphic and the results predict a 13% loss of sales. Tropicana shoppers don’t see new packages at shelf and are drawn to Tesco’s own brand products that have some similarities to the UK Tropicana pack. The truth about the sales loss has little to do with that graphic, and everything to do with shoppers ‘ability to find the new packages at shelf. Consumers have to find the product at shelf before they can buy it. One eye tracking study and this could have been avoided!